Your boiler is one of the most heavily used appliances in your home. A combi-boiler that supplies your hot water and heating will be running 24 hours a day, 7 days a week for the vast majority of the year - and at some point you will need to have a new boiler installed. For most people, there are many questions when it comes to new boiler installation. In this article, we will look at some of the most frequently asked questions. How long does a gas boiler last? Just like a car, there is no hard and fast rule for how long you can expect a gas boiler to last. The lifespan is affected by many factors such as the amount of use, the make and model, how often it has been serviced, how well it has been installed and more. As a guideline, a typical gas boiler can be expected to last in the region of 15 years, however this is only a rough estimate. In most cases, it is recommended that you begin planning the installation of a new gas boiler in advance, rather than waiting until it becomes an urgent necessity. Planning ahead for your boiler replacement will allow you to take into account important considerations such as energy saving and efficiency, as well as available budget. It is also worth considering your current and future needs to determine which boilers might be best suited. Investing more in modern technology now may offer substantial savings in the long term. It is also worth bearing in mind that boiler technology has developed so much over the last few years that it may be in your interests to consider upgrading your boiler sooner than originally planned to take advantage of increased efficiency offered by energy saving technology. There are many signs that boiler replacement is necessary or imminent, and many of these can be identified long before it stops working completely. One of the most obvious signs, of course, is frequent breakdowns that mean you are constantly having the boiler repaired. If this is the case, you may find that you actually save money in the long term by simply choosing to replace it with a new boiler. Another sign is that you have to keep restarting the boiler or if it is costing you more than you want it to. Other common indicators that it is time to consider boiler replacement are if you are finding it difficult to keep your house warm or your water is not hot enough. This may mean that your boiler is no longer operating as well as it should, or that it is simply no longer sufficient for your needs. In either case, a replacement is a good option. Finally, if your boiler is making noises this may also be a sign that it is coming up for a replacement. How much does a gas boiler installation cost? Because every home is unique and different households have different needs, it is not possible to provide a one-size-fits-all answer when it comes to replacement boiler cost. When you are looking to have a new boiler installed, there are two things to think about when it comes to costs - the price of the boiler itself, and the cost of having it installed by an appropriately trained engineer. UK law requires all gas boilers to be installed in accordance with the Gas Safe rules and regulations, which means this is not something that you can do yourself. Factors that can affect the cost of the installation are whether you are planning to replace an existing combi-boiler with an equivalent in the same location, or whether you wish to have a replacement boiler installed in a new location. If you have chosen to go for something that is completely different to your existing system, then this will also have an impact on the installation cost. As regards the price of the boiler itself, this depends on factors such as the type and size of boiler, technology and special features, etc. and can only be accurately established at the time of enquiry. How long does boiler installation take? This will largely depend on the same factors previously outlined regarding the cost of installation, however as a guideline a like for like replacement that connects directly to the existing pipework could be be fitted in a single day. If for any reason alterations to the existing system are required or the system needs powerflushing, then the boiler installation may typically take between 1-3 days. Finally, if you have chosen to install an alternative system such as a heat pump, you may need to allow up to 3-5 days depending on your specific situation to allow for additional work such as drilling which may need to be carried out. The most common type of boiler in the UK is a combi-boiler. This is a single unit that provides both heating and hot water. It runs directly off the mains and does not require any kind of water storage tanks as hot water is produced on demand. 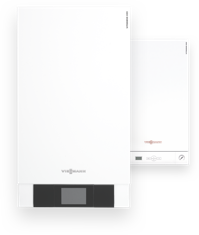 Combi-boilers can be gas or electric and are ideal for small and average houses. Larger households, those with multiple bathrooms that are likely to be in use simultaneously or households who want strong showers or quickly-run baths will be better suited with an alternative, known as a system boiler which can offer a more balanced supply when there is multiple demand for hot water. Apart from the type of boiler, consider other factors you wish to have such as higher energy efficiency or additional functionality such as smart controls at these will all affect your choice of boiler.